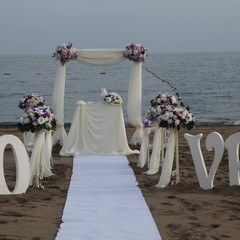 Beach wedding in Turkey has been always magnificent. As a wedding planner, we love to organize the weddings on the beach by offering beach wedding packages. Madleen & Musa reached us via our partner in Germany Ms. Birgit Löbe. Their wedding planning was made in 2014 which will be a beach wedding in Turkey. We met with Musa for his required documents for legal marriage over phone 3 months before the wedding. Musa was a Turkish citizen but born in Germany. Madleen was Germany citizen. They bot was a hair-dresser in Germany. Couple was very excited. They were planning to come to Turkey with their 2 friends which will be the wedding witness. We were on the day of the days. 20th September 2015 formal wedding ceremony would be held on the Mediterranean beach of the Limak Lara De Luxe Hotel. All preparations have been completed. 19th September 2015 was very special for Madleen since it was her birthday. We had a correspondance with Musa on 18th September. We wanted to remind him to don’t forget the original documents to bring with you, Dear Musa sait us taht he couldn’t find his Turkish ID (birth certificate) in his papers and he forgot the most important document in Germany. It was not possible to do his paperwork without a birth certificate. We had a correspondance until 24:00 o’clock. His family found the birth certificate at the late time and his brother delivered us the original birth certificate before the official marriage ceremony. Madleen’s birthday was very negative history. We have prepared a magnificent decororation on the Beach to fell her happy. We have prepared an unforgettable wedding ceremony. It’s one thing after another. In the evening on 19th September, It rained until the morning. It was not possible to organise the wedding on the Beach. We woke up with sunny weather but the weather forecast was saying that the day will be rainy. Therefore we suggest them to celebrate the wedding in outdoor. Madleen declined or recommend since she was definetly was wanting to get married on the Beach. It was her dream. Therefore we have prepared the decoraiton on the Beach. Everything was wonderful. We were excitedly waiting for fort he 17:30 o’clock to make a surprise for Madleen. Unfortunately, It started to rain. Besides the very heavy summer rain. We immediately covered the prepared decoration with my team. We all were drenched and thinking in a panic about what would we say to Madleen. Meanwhile, the bride’s hair and makeup was doing. She didn’t see that It is raining. Rain was finished on 16.30 o’clock and Sun was shining with all its beauty. We have finished the last preparations. Registrar was also came to the wedding venue. Dear Madleen & Musa appeared with their wedding consultant and witnesses. An outstanding beauty bride and groom were coming to the wedding ceremony. They were very happy. It was a very difficult wedding ceremony. Also, it was very nice and amusing. I don’t remember that much fun before. We wish them happiness for the rest of their life.